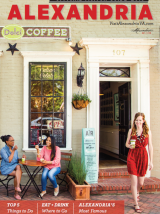 Downtown Alexandria has been identified as the metropolitan area&apos;s top ArtPlace. The designation, awarded by ArtPlace, recognizes neighborhoods where the arts are central to creating the kinds of places where people want to be. These communities have been exceptionally successful at combining art, artists and venues for creativity and expression with independent businesses, retail shops and restaurants, and a walkable lifestyle to make vibrant neighborhoods. "The impact the arts have had on the vibrancy and economy of Alexandria is unmistakable," noted ArtPlace director Carol Coletta. "This study shows how the arts can provide a foundation for a diversity of neighborhoods to thrive." ArtPlace&apos;s determination of the Top ArtPlaces in the country was based on a set of six indicators identified by Impresa Inc., a Portland-based consulting firm specializing in the study of metropolitan economies. Four indicators measure ingredients of vibrancy: the number of retail and service businesses; the percentage of independent businesses; the neighborhood&apos;s Walk Score; and the percentage of workers in creative occupations living in the neighborhood. Two arts-related indicators were also used: the number of arts-related non-profits and the number of arts-related businesses. Finally, neighborhood scores were normalized for family income so that neighborhoods with the highest concentration of income did not skew the results. "Arts and culture are underused assets for improving the vibrancy of cities and local economies," said Carol Coletta of ArtPlace. "This list reveals the real potential in cities from Baltimore to Anchorage to tap into that resource and create lasting change. Art and artists are already creating the kind of places where people want to be." ArtPlace is an initiative of national and regional foundations, various federal agencies, and major banks to accelerate creative placemaking across the U.S. ArtPlace provides grants and loans, supports research, and conducts outreach and advocacy. To date, ArtPlace has awarded 80 grants totaling $26.9 million to 76 organizations in 46 U.S. communities. For more information about ArtPlace, visit http://www.artplaceamerica.org.